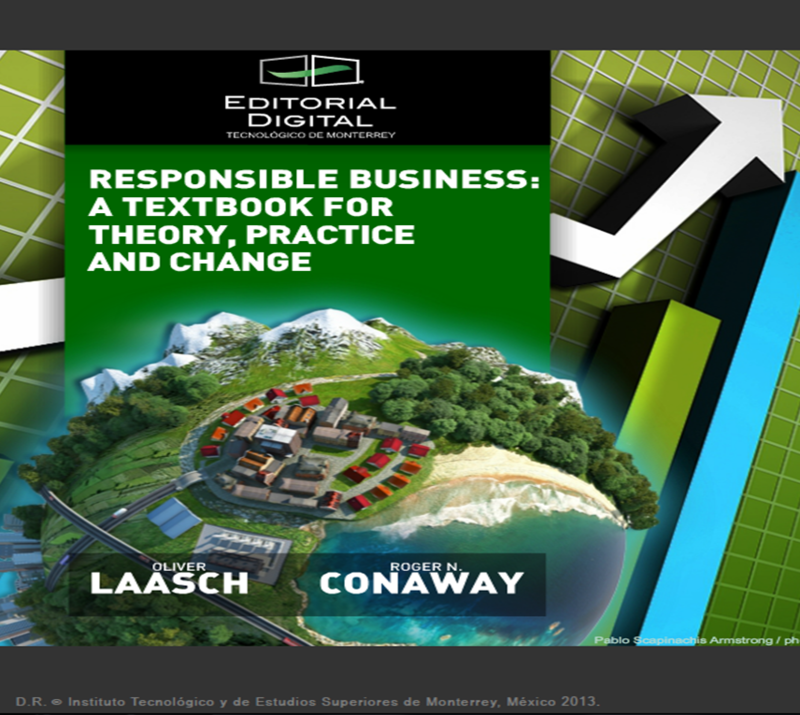 The Center for Responsible Management Education (CRME) proudly announces the new textbook “Responsible Business: A Textbook for Theory, Practice, and Change”, authored by Oliver Laasch and Roger N. Conaway, an introductory resource for courses on business sustainability, responsibility and ethics. The book is an initiative of CRME in support of the UN Principles for Responsible Management Education initiative. It is tuned in to close the gap in responsible business lecture materials for undergraduate students, for interdisciplinary courses, and for interactive, blended online-offline learning environments. “Responsible Business: A Textbook for Theory, Practice, and Change” aims to balance fundamental concepts and inspiring practice-application. Each chapter includes 15-20 text boxes with practice contents, 5-15 figures and tables, an end-of chapter multiple-choice test, glossary, and additional web-based materials. For exemplary screenshots from the book, please click here. “Responsible Business: A Textbook for Theory, Practice, and Change” has been designed to be globally accessible through the internet at a very reasonable price. The book will be available in two different digital formats, as a pdf-based ebook on the website of the publisher Editorial Digital (available from 23rd of September 2013), and through iTunes (available from 1st of November 2013) for a price of 20-25 USD. Both formats can be used on a typical computer and most tablets. The navigation of the ebook is tuned in to the a flexible, lateral learning style, representing the preferences of many, especially younger internet-native students. If you are interested to discuss the book, adopt in class, or if you search for lecturers teaching with this book, please get in touch with Oliver Laasch through olaasch@responsiblemanagement.net. The book is organized in three main parts, Theory, Practice, and Change with the goal of enabling students to develop responsible business practices based on solid knowledge and to equip them with effective tools to challenge the status quo. 1) Framing: Chapter 1 frames responsible business by providing a timeline of the significant historic developments in theory and practice of sustainability, responsibility, and ethics, and through a snapshot of the status quo of the business, society, and environment relationship. 2) Understanding: Chapter 2 enables a basic understanding by introducing fundamental concepts of sustainability, responsibility, and ethics and by interrelating them in theory and practice. 3) Managing: Chapter 3 provides management know-how by introducing the responsible management process, by illustrating central management instruments (e.g. stakeholder management, life-cycle assessment, ethics management) and norms (e.g. ISO 26000, GRI). 4) Planning: Chapter 4 highlights the planning processes in a responsible business, including basic considerations (e.g. profit orientation, growth), analyzing the status quo, and of strategic planning in responsible business. 5) Implementation: Chapter 5 illustrates the implementation of responsible management throughout main company functions such as accounting, marketing, legal affairs, and supply chain management. 7) People: Chapter 7 takes a people perspective on necessary changes related to responsible business by illustrating the relationship between human characteristics and sustainable lifestyles, and through the topics of individual activism, change agency and leadership. 8) Business: Chapter 8 illustrates change process for the creation of responsible business through the transformation of existing businesses, and through the creation of new enterprises. 9) Economy: Chapter 9 takes a systemic perspective on change and illustrates how to create networks of responsible businesses, such as sustainable supply and demand systems, responsible business clusters, and industrial ecosystems through the collaboration of civil society, government, and business actors. 4 Pings/Trackbacks for "Textbook “Responsible Business” Now Available"